Gator Cases Hard-Shell Wood Case for Standard Electric Guitars; Fits Fender Stratocaster/Telecaster, More (GWE-ELECTRIC) by Gator at Tritone Guitars. MPN: GWE-ELEC. Hurry! Limited time offer. Offer valid only while supplies last. Durable enough to withstand daily use, this hard‐shell wood case is lightweight, sturdy, and designed to keep your electric guitar safe and sound. Durable enough to withstand daily use, this hard‐shell wood case is lightweight, sturdy, and designed to keep your electric guitar safe and sound. Ultra‐durable plywood forms the front and back panels of this ultra‐slim carrying case, which is covered in Tolex PVC for added moisture protection and durability. Unsnap the chrome plated lockable latches to reveal a spacious interior fully lined in plush fabric, which cradles your instrument while keeping it safe from dust and debris. The body cavity is engineered to fit standard electric guitar models and a foam core bridge provides additional support to the neck and headstock. The interior storage compartment, located beneath the guitar’s neck, provides ample storage for straps, tuners, picks and accessories. A carefully positioned, ergonomically designed handle evenly distributes the weight and provides a firm, comfortable grip. 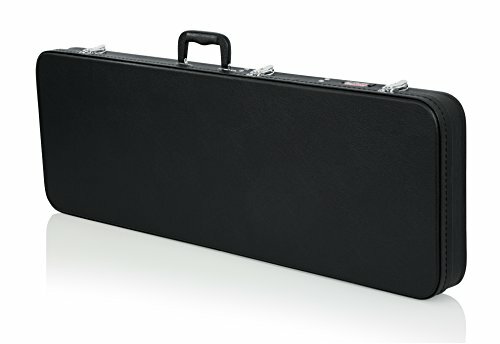 For regular storage, short‐distance travel, and a reasonable price – any musician and every guitar would be happy to have this case. Interior Dimensions:Body Length: 18.88"; Body Height: 3.13"; Lower Bout Width: 13.00"; Middle Bout Width: 13.00"; Upper Bout Width: 13.00"; Overall Length: 39.50 "
Giuliani Professional Padded Guitar Bag - Classical 40"